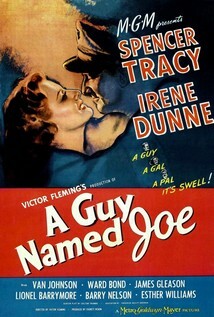 The other day I got to thinking about movies with the name 'Joe' in the title. Why, you ask? I've got no idea. It's just the way my brain works. Some of my very favorite movies are on the list. And the originals/remakes are great, too. So if you're in the mood for an obscure movie (and a good one), stick around for the list. 1. A Guy Named Joe. Spencer Tracy and Irene Dunne. Already you can't go wrong with this movie. Van Johnson's in it, too. It's an all-star cast. Maybe you saw Steven Spielberg's remake, Always. That one has Richard Dreyfuss, Holly Hunter, and John Goodman. Both are excellent. Both follow a similar story line, with the original taking place during WWII and the remake in the late 1980's. I hesitate to tell you the story line because I don't want to spoil it, but I'll tell you it's a love story that involves airplanes and loving someone enough to let them go. Please go watch both of them. I own less than 20 DVD's and Always is one of them. 2. Joe Versus the Volcano. You may have seen this one. Then again maybe not. I read somewhere it was Lloyd Bridges' last film. You can fact check me on that one. Tom Hanks and Meg Ryan (playing three roles). Tom's got a brain cloud and is going to appease a god by jumping in a volcano. I just watched it for the first time in many years last week. Still fun. I love you Tom Hanks (he went to my high school, btw. See, I didn't just attend school with axe murderers. Of course he's much older than me). 3. Joe's Apartment. This obscure 1996 film stars Jerry OcConnell. Prior to this film, everyone knew him as the fat kid in the movie, Stand by Me. It's a musical, where all of the singing and dancing is done by giant cockroaches. Yep. Not for everyone, but funny. Don Ho has a small part as a bad guy. Go Don Ho. This one will be hard to find. Looks like there are some clips on YouTube, if you're curious. 4. Mighty Joe Young. The original is my husband's favorite childhood movie. Classic Ray Harryhausen stop motion (he also was responsible for the original King Kong animation). Worthy of watching. I liked the remake a lot, too. Early Charlise Theron. Already you can see her acting chops. 5. Meet Joe Black. Brad Pitt. Did I mention Brad Pitt? Anthony Hopkins as well. A quirky concept for a movie. The original was Death Takes a Holiday. It's a pre code 1934 film with Fredric March. I've seen it. I like it, but I like the measured pacing of the remake even better.